Rajkamal Barscan Systems Pvt. Ltd., was established in the year 1996 being a leading supplier of Automatic Identification & Data Collection (AIDC) solutions in India. All businesses have a need to identify, track and manage critical assets, resources and information, be it a chemist shop across the street, a global courier company delivering millions of articles or a manufacturing company. 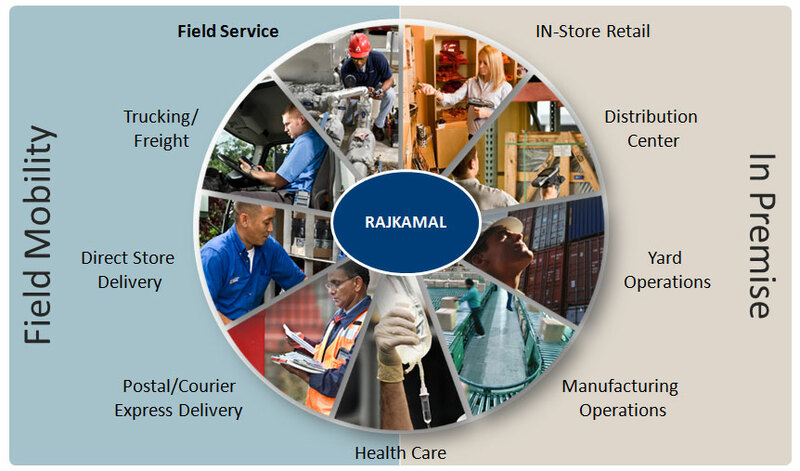 Rajkamal helps it's customers to keeping track of what's where. Rajkamal's understanding and experience of the Indian industry coupled with internationally accepted cutting edge technologies from its principals gives it a leading edge in meeting with its client's expectations. Rajkamal Bar-Scan Systems Private Limited is the trusted advisor for decision makers and channel partners for implementing industrial-strength mobile data capture systems & Printing Solutions in defined verticals & target markets. 2010: Appointed as Intermec Technologies Platinum Partner. 2011: Warehousing Automation Order from Hindustan Lever Limited for HHT and Printers. 2012: Border check post RFID order from Maharashtra State Transport Company Limited. 2013: Warehousing Automation Order from Reebok / Adidas / DuPont for supply of Intermec CK3 Wireless Mobile Devices. 2014: RFID based Warehouse Management System implemented in Lubrizol India. 2015: RFID based File Tracking System implemented in Lubrizol India. Applications- Asset tracking, Retail, Point-of-Sale, Warehousing, Logistics, Work in Progress etc..
Handheld Solutions such as order taking, route accounting, asset tracking etc. GSM/GPRS/EDGE/GPS Connectivity based offering for Field Applications. Software for Label design & Bluetooth printing. Project Management (Auto ID Solutions)– Consultation, Implementation, training & Roll Out. 65 Strong Professionals with Sales + Service / Support Engineers. 20 people for Admin + Accounts + Logistics operation. Intermec by Honeywell Largest Partner in India. Strong Foothold in Manufacturing / Transport & Logistics / Government / Retail Sector. Broadest line of AIDC products.